Over the years, Rhodia customers have requested a weekly planner. 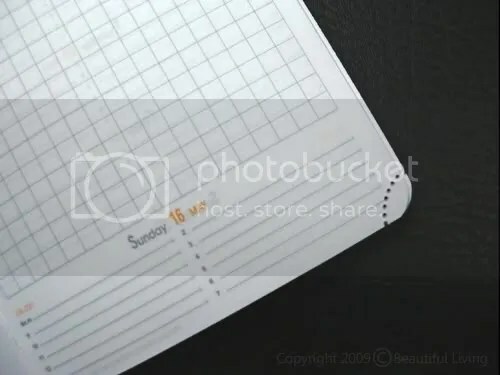 In response, Quo Vadis introduced the Rhodia Weekly Notebook for 2010. It is available in two sizes, and two colors-black and orange. In keeping with Rhodia’s famous notepads, the notes pages are gridded. For those of you who use fountain pens, the large edition (6″x 9″) is fountain pen friendly at 90 gr. Rhodia's 2010 Weekly Planner has a flexible black cover with the Rhodia logo embossed on the cover. A vertical elastic strap keeps the planner closed and compact. For this review, I will be exploring the Pocket sized Rhodia Weekly Planner that was provided by Karen Doherty at Exaclair. Unlike it’s larger, 6″ x 9″ sibling the 4″ x 6″ Rhodia Weekly Planner has 64 gr. paper, not the best choice for fountain pens, but more than adequate for ballpoint pens, pencils and even some markers. According to the folks at Rhodia, these are the specs for the 2010 Rhodia Weekly Notebook. The cover of the planner is stiff, but flexible and has just the right amount of give. The leatherette finish is attractive and has as the slightest texture of leather. When viewed from a distance, it has a matte finish which is subtle and sophisticated. A vertical elastic strap wraps around the right side of the planner that keeps the planner compact. The overall measurements are 4″ x 5¾” x 3/8″ thick. 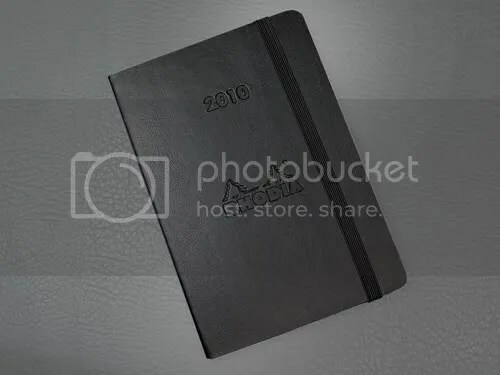 Since it is larger than most pocket sized planners, you’ll have a little more room on the inside to write, but you may find that it doesn’t fit your jeans or shirt pockets. The Rhodia logo and “2010” are embossed on the cover and are quite large relative to the size of the planner.Luckily, the color is subtle so it is less obtrusive than it could be. If you are prone to collect little black books, this could be a good thing since the large logo will stand out from the sea of black. The cover is slightly stiff, but flexible offering just the right amount of give. When opening the planner, the first thing that strikes me is the beautiful paper. It is bright white, super smooth and offers good contrast to the grey and orange print. The planning section includes equal-sized sections for the entire week. Monday through Saturday occupy the left page while Sunday shares the right page with a large gridded area for notes. The weekly planning format is good for scheduling appointments in an hourly format with planning periods 8:00 am through 7:00 pm. There is not much room for adding appointments on the half-hour, but a simple vertical line through the schedule would allow you to add half-hour increments. 12-hour time designations allow you to schedule with ease without having to mentally convert to military time. The planner lays nearly flat when opened, but I imagine that it will open flatter with time and use. 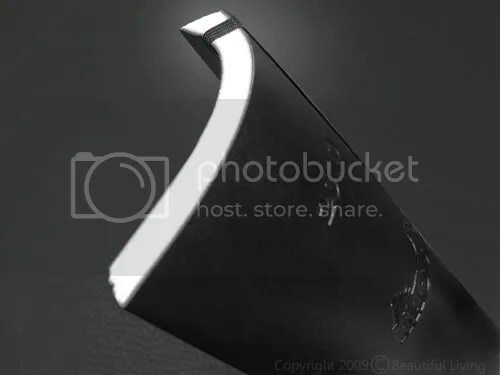 Because of the way it is bound, there is no annoying hump in between the pages when it is opened. The binding is thread-bound and the threads are a bright white like the paper and are only visible in the center of each signature. Rhodia's weekly format features 6 days of planning on the left page and a squared page for notes on the right. Each day of the week has equal planning space, but Sunday shares the right page with the gridded section. Tear-off corners on the planning pages are used rather than a ribbon book mark to keep your place. Once a day has passed, just tear off the corner. This will enable you to thumb to the current day. personal notes including room for name, email, website, driver’s license, license plate, emergency contacts, etc. Overall, the Rhodia Weekly Planner is an interesting new addition to Rhodia line. It offers a everything you need for planning on-the-go in a package of high-quality materials. 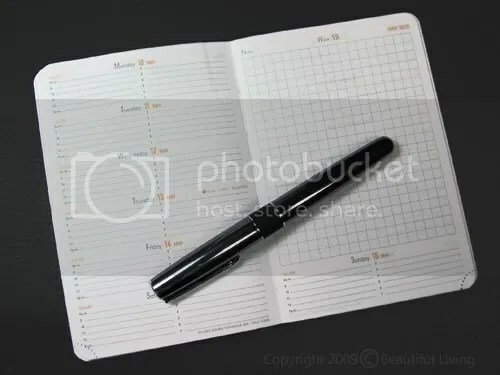 The size is slightly larger than most pocket planners so it is easy to write in, but it is still small enough to stash in a large pocket or purse. The narrow profile and flexible cover make it feel less bulky than most pocket planners. The paper is thinner than I would prefer, but it is bright white, beautiful and smooth. The gridded paper an interesting combination with the planning pages and would be really useful if you are prone to doodle. 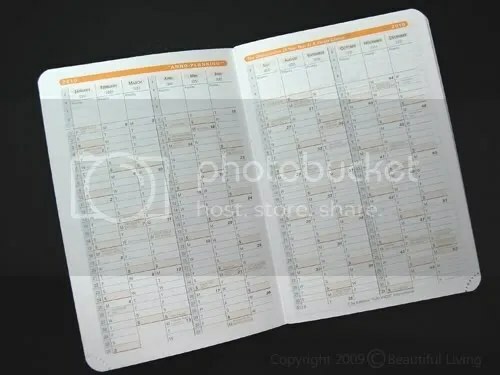 2010 and 2011 monthly planning calendars show the entire year at a glance. The back of the planner includes a ruled page for notes and an alphabetized address book. Hi. Great review. I’m sold. May I ask what style of pen that is in the 3rd picture? I love it. Thanks again for taking the time to review this journal. I’m ordering mine tonight. Thank you for your comment about the Rhodia Planner. It is a great new alternative by Rhodia and a good choice for those looking for something a little different. The pen in the photo is a Tombow Ultra Rollerball pen and my personal favorite. I love the smooth rolling ball and the saturated ink. I use one for art as well as for writing. You will find a variety of finishes in the Ultra available at http://www.journalingarts.com. I wonder if these are also made in China? Thank you for your comment. 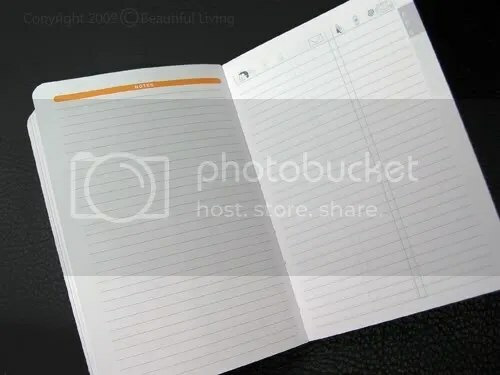 My understanding is that this planner is is made by QuoVadis in the USA for Rhodia. Thank you for including Naw Ruz (Baha’i New Year) in your planner.